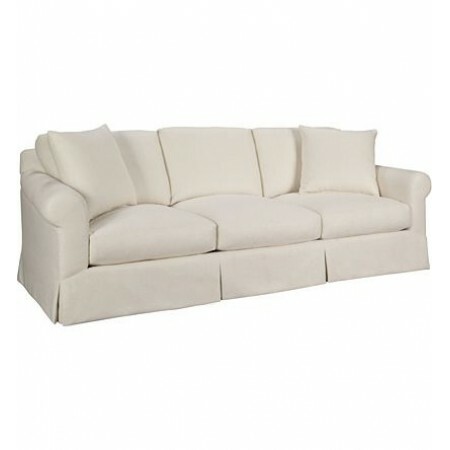 Celine was inspired by the large, luxuriously comfortable sofas that are found in European country homes. The deep seat and relaxed look makes it appropriate for casual living as well as more formal settings. Celine's arms have an elegant slope from the back to the termination of the sock arm. The skirted version shown features soft dressmaker tailoring. Medium Mahogany is the standard finish. Two 22-inch 100% goose feather throw pillows standard in fabric. 3-piece Luxury Spring-Down seat cushion and 3-piece Blend-Down back cushion standard.